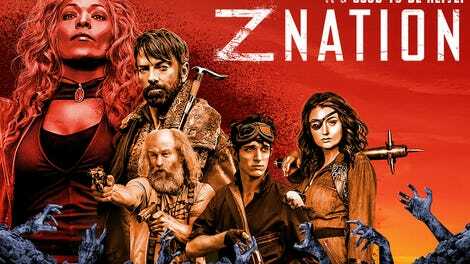 “Those bums in Congress have done it again!” That exact cliche wasn’t uttered in this episode of Z Nation, but it may as well have been. When it comes to obvious comedy targets, politicians are right up there next to lawyers: very large fish in a very small barrel. Not that it wasn’t enjoyable seeing our heroes turn their sights on what remains of the American government. Despite the hoariness of the “politicians are the worst” gags, most of what came out of everyone’s mouths in “Mt. Weather” was still breezily enjoyable, albeit in a fairly unremarkable installment. You know all the old jokes about people hating politicians are stale when re-situating them in the context of a zombie apocalypse actually makes them sound fresher. The show’s last attempt at mocking politics was much more on the nose; this was like an old friend playing some greatest-hits bits from the Johnny Carson show. If not much happened outside of getting the old president’s thumbs in order to continue the journey to Black Rainbow, this lightweight episode nonetheless explicated the government’s seemingly crazy “4th strike” scenario, and did so with a fast-paced and fun-minded script that allowed the time to pass by in genial and entertaining fashion. 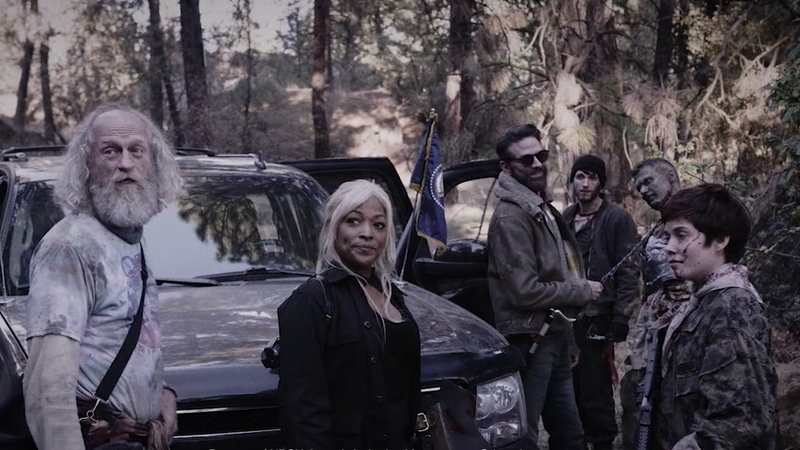 The moment Doc and Murphy walked out of the top-secret “Cryptozoology” room talking about Bigfoot, it was clear what kind of Z Nation this was going to be. The duo’s game of “who can deliver the best one-liner while eviscerating zombie Congress” was just icing on the good-natured (if forgettable) cake. It seems Teller was in contact with President Jane Carlson (notwithstanding the couple hundred people who held the job before her) in order to explain Black Rainbow’s potential. The old VHS tape depicting an even older-looking educational video about the devastating ability of the weapon (which required a little nudge to play—“This is what happens when you get your budget cut”) lays out exactly what will happen, and how. Necrotizing fasciitis is a very real flesh-eating bacteria, although it normally doesn’t work quite as fast as Warren’s dreamworld makes it look. Of course, we saw the Man With The Plan test some much faster-acting green gas back in the very first episode, so Black Rainbow probably has a lethally rapid pace at this point. But the president’s eventual reveal as a tool of Zona raises an odd question: How come Warren and Murphy never point out that everyone at Zona went insane? Last we saw, that entire society was imploding thanks to degenerative brain disease, with the vaccine failing and turning everyone into flesh-ripping maniacs. Wouldn’t that be something one of the two might want to mention, since Carlson announces her plan to flee to Zona tomorrow? Sure, the Man With The Plan is still alive, so not everyone died, but from the point of view of our team, going there would be tantamount to suicide. Not bringing it up as a way to convince Carlson of the need to stop Black Rainbow doesn’t make much sense. Then again, the reveal of the secret service agents and Carlson as Zona-backed monsters was a little awkward. Carlson seems genuinely surprised when Warren tells her they’re trying to stop the weapons project from being initiated. If the three of them assumed our protagonists were on their side this whole time, why feed them the cover story about NewMerica in the first place? Either you’re going to kill them, or you’re going with them to Zona; either way, the twist was a bit awkward. At least it was enjoyable. The absurdity of having Murphy sniff the jackets aside, the painstaking process of grabbing Zs one at a time to look for the president was funny, and even Sarge’s double-cross (followed almost immediately by a triple-cross back to the right side) was a decent appeal to the soldier inside of her, even if she quickly came to her senses after realizing following orders would mean the extermination of countless innocent people. But it doesn’t erase the possibility that Warren’s vision quest is about activating the weapon instead of preventing it from launching. As Carlson points out, the canisters she’s been collecting seem way more like payloads for a group of ships than anti-weapon vaccines, or something. NewMerica is doomed unless Warren and the others can stop those automated ships from taking off, and now that they’re only an hour from D.C., we’re about to find out if Warren’s been programmed to stop Black Rainbow—or if she’s been sent there to make sure her dreamworld scenario comes to pass. There’s a lot of ground to cover next episode, and while I’m still optimistic, the back half of the season has been notably rockier than the front. It’s possible all the threads we’ve been following could be dropped altogether: The mysterious mass vanishing, the explanation of Warren’s preternatural abilities, the Twilight Zone-esque outpost...all of it might get cast aside in slapdash manner. But the series has committed itself so strongly to its new and improved manner of storytelling, it would be a shock to arrive at the endpoint and not see some indication the writers are on top of it. The finale doesn’t have to address everything, it just needs to remind us of the fundamental elements of the narrative, and prove it hasn’t all been an inexplicable diversion. I know you have it in you, Z Nation. Credit where credit’s due: “Mt. Weather” featured sparing and appropriate use of slo-mo! People getting out of cars: No. Two ex-secret service mad Zs getting vaporized with machine guns: Yes. The cast of Hamilton got trapped on the bottom floor, too. Even at a secret underground facility built for the government to ride out just such an emergency (which is a real place, if you didn’t know), there’s still an extra-secret floor just for the leader of the free world. Speaking of which, nice touch having “Hail To The Chief” playing over the speaker system as Warren searches the place. Excellent transition, the dangling eyeball of the First Gentleman of the United States segueing smoothly into the opening credits. “President Warren—I like the sound of that.” I think this show just subtly expressed its preference for someone in 2020. UPDATE: Sorry, didn’t mean to confuse anyone looking for the finale review as well. There was no screener provided for it, so there will be a slight delay until it posts.